This is one of the first biryanis I tried when we started entertaining and I wasnt still comfortable cooking meat or chicken. So I would stick to a chicken curry and stay safe with the rice. Plus in Chennai, we had friends who were vegetarians and it made sense to have one main which everyone could enjoy. More convenient for me as well to come home after work and just concentrate on a few things for dinner. But this biryani is definitely magical - good times assured and some very satisfied diners. Every. Single. Time. Don't take my word for it - go ahead and try it. I used to think it may have been all that rum and cola we DINKS were consuming - but no, its improved its reputation even as our choice of drinks has become a little more diverse and refined. And now, since my repertoire has expanded in the past 14 years, I make this as a Sunday lunch as well - its no longer a "party dish" alone. I do have a confession though - part of this dish's popularity is aided by the addition of a ready made ingredient - Parampara Biryani Masala. It doesn't completely rely on it, but the taste definitely improves with the addition. You could replace with some other commercial biryani masala - I have tried Everest which works well too. This is going to Tickling Palates' event Hibernative Foods - she says our ancestors instinctively prepared foods which matched the seasons. Which is why, she says, the festival season from Dasera to Diwali during the cooler months, sees a surfeit of protein rich and fatty foods like sweets and savouries. So, the brief for this month was to prepare food rich in proteins as well as fat. Biryani of course is definitely a winter dish with its warming properties....and its a rich dish with protein and fats in the form of the vegetables, ghee and yoghurt. 1 Cook basmati rice in lots of salted water along with bay leaves, cloves, cinnamon, cardamom,cardamom and oil till it is three fourth cooked. Drain the rice, fluff with a fork onto a platter and keep aside. 2 Heat the ghee or oil in a heavy bottome pan, add the sliced onions, saute for 8-10 mts till nice and brown. Reserve half of the onions for garnish. 3 In the same pan, add the ginger garlic paste,green chillis, mint leaves and coriander leaves lightly fry for 2-3 minutes. 4. Add the red chilli powder and biryani masala along with the chopped tomatoes and fry for 3-4 minutes. 5. Add the yoghurt and salt and mix well. Cook for 5 minutes till the masala comes together well and then add the vegetables, fry 2 minutes and cover and cook till just tender. Turn off flame and keep aside. 6. .In a baking dish, smear some oil at the bottom and arrange half of the par boiled rice in an even layer. 8. Spread the remaining rice over the masala, top with the fried onions and some more of the coriander and mint leaves. 9. Cover with foil and bake in a pre heated oven at 190C for about 30 minutes. let rest uncovered for about 5 minutes before removing the foil. That looks so very good. I am a lot more confident about my Chicken Biryani than Vegetable Biryani. Vegetables cook too fast and my rice invariably turns mushy. There is that risk in stove top cooking - but finishing it off in the oven makes this almost foolproof! Wat a flavourful briyani, i dont bother to have some rite now.. I got to agree, it is a party pleaser. That looks wonderful! The Parampara masalas; especially the biryani paste is too good. that bed of fried onions looks so good. 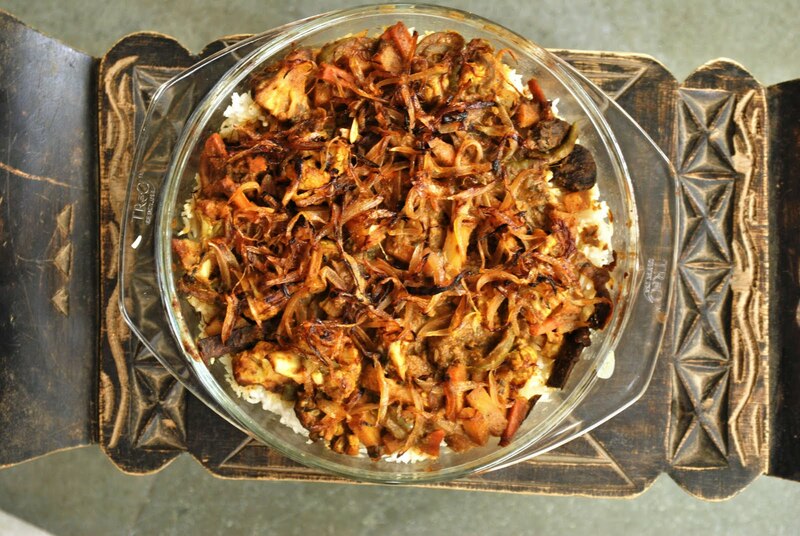 Your biryani looks spectacular... For some reason, my veggies turn to mush and my rice never feels like it's flavored enough with the whole spices. I am going to have to try your recipe this weekend. BTW - did you have a problem with the yogurt curdling? I have not tried Parampara Biryani masala, thanks for the idea. Your Biryani looks so good. Only yesterday S was asking me to make a veg Biryani like she had at Sarvana Bahvan, so veg biryani it is going to be. Alps, I agree about some recipes leaving the rice underseasoned- but between the spice powders and the biryani masala this dish is super tasty. I don't have a problem with the yoghurt, maybe you should make sure that the flame is not too high when you add the curd. 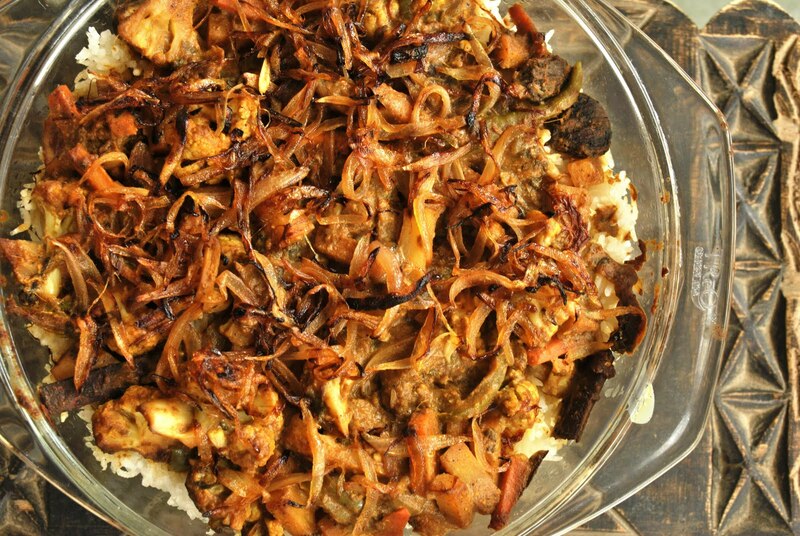 The slow cooking in the oven definitely helps the rice and veggies from turning mushy- Try it! Bookmarked! In fact, I am going to try all your biryanis!